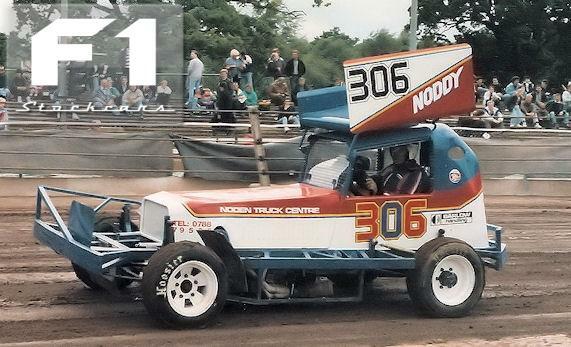 Mick Noden (306). Photo courtesy of Paul Tully. Following a lengthy apprenticeship in the sport during the 1960s, mainly spent racing his self-built car around the midland tracks, Mick gradually honed his race craft and construction skills to a point where he started to move up through the grades. 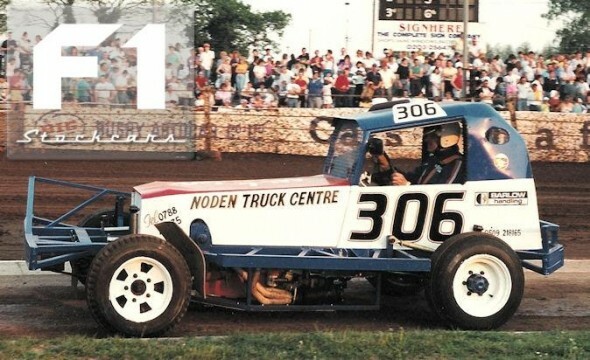 He scored his first final wins at the end of the decade, by which time he had become a constant feature in the top ten points scorers. Final wins however remained an occasional highlight in the distinctive, Oldsmobile powered 306 machine, but that all changed in 1972, with a concerted, season-long, effort, that saw him notch eighteen final wins and take the race for the silver stripes right to the end of the season. He was to finish runner-up to the Stuart Smith “rollercoaster” that year, but Mick was a match for anyone during this time. Famously refusing to take the start – from pole position – of the 1973 World Final at Harringay, as a protest against their use of barrels, he enjoyed a measure of success in the big one – finishing second in 1972 and 1979 and third in 1974. The latter half of the 1970s saw him scale back his racing activity, though he appeared sporadically – and successfully – during the mid-80s, before bowing out with a final victory, his 67th, at Coventry, where it all began almost thirty years earlier.